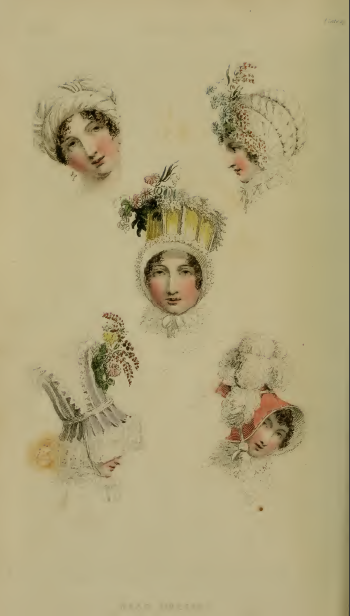 The last issue of Ackermann’s Repository for 1814 features an unusual fashion plate: a collection of five different head-dresses! 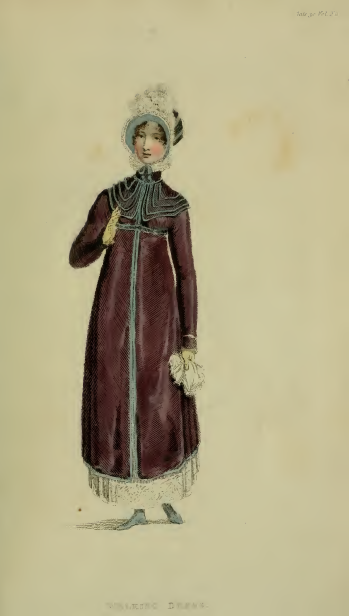 From the simple cottage bonnet (#4) to the elaborate Russian à la mode (a tall, almost stovepipe top, but without the coat-scuttle-like brim of the Oldenburg bonnet), 1814’s Regency lady could find examples of hats for any and all occasions. I’ve never heard of a “melon cap” (#2) before, but I’m rather taken by it, with its puckered satin and what is described as “narrow bead trimming inlet.” I wonder what it looked like from the front? Which bonnet would you choose to step out in to celebrate December’s festivities? 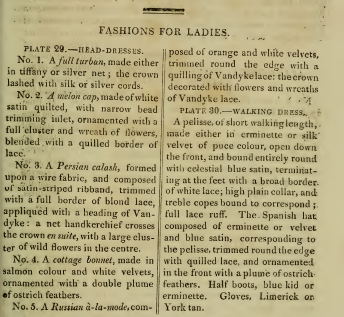 If none of the above are to your taste, perhaps you would prefer the “Spanish hat” featured in plate 30 (below), which is paired with a short, walking-length pelisse in puce. I think of puke green when I hear the word “puce,” but here it refers to a dark purple brown or brownish purple color. But even this version of puce has gross-out associations: puce is the French word for “flea,” and the color is said to be the color of what remains after a flea has been crushed. For a color with such an unpleasant name, it certainly appears attractive in this plate, especially with the unusual choice to pair it with trim of “celestial blue satin.” And are those triple “copes” meant to echo the Garrick coats, with their three to five caplets or collars, favored by those dashing Regency gentleman noted for their driving skills? 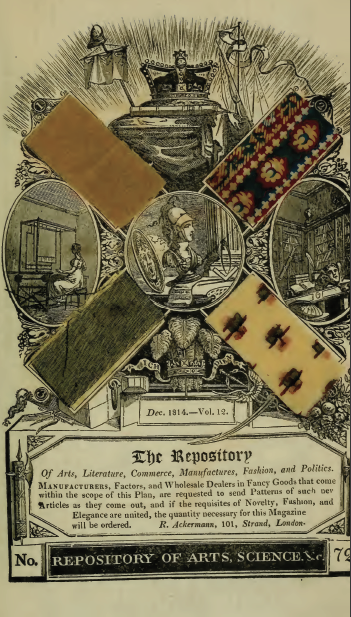 The year’s volume concludes with “Patterns of British Manufactures,” rather than with the needlework patterns that had become far more common in the journal during 1814. Was the expense of cutting out and glueing down these small fabric scraps growing too costly to keep up? Or were manufacturers less interested in displaying their new wares in Ackermann’s pages than when the Repository was new? Happily, this month’s fabric samples include one of “erminette,” a fabric also used in the Walking Dress of plate 30. Yet another fabric term that sent me scurrying to my dictionary! 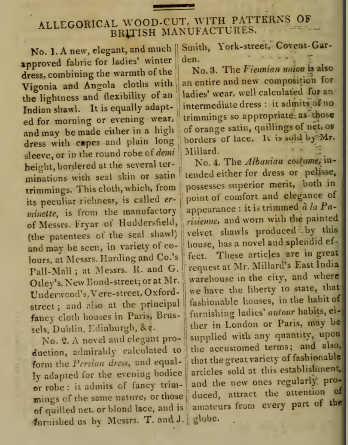 The long description of the sample states that this fabric is a new invention, created by “Messrs. Fryar of Huddersfield (the patentees of the seal shawl).” This fabric, it is claimed, “combines the warmth of the Vigonia and Angola cloths with the lightness and flexibility of an Indian shawl.” Fairchild’s Dictionary of Textiles, which describes it as “a brown woolen dress fabric,” has the dating a bit off, stating that it was produced in the late 19th century. Two of the other fabrics are suited for more exotic outfits: the “Persian dress” and the “Albanian costume.” For holiday masquerades? Or just for a touch of the unusual?